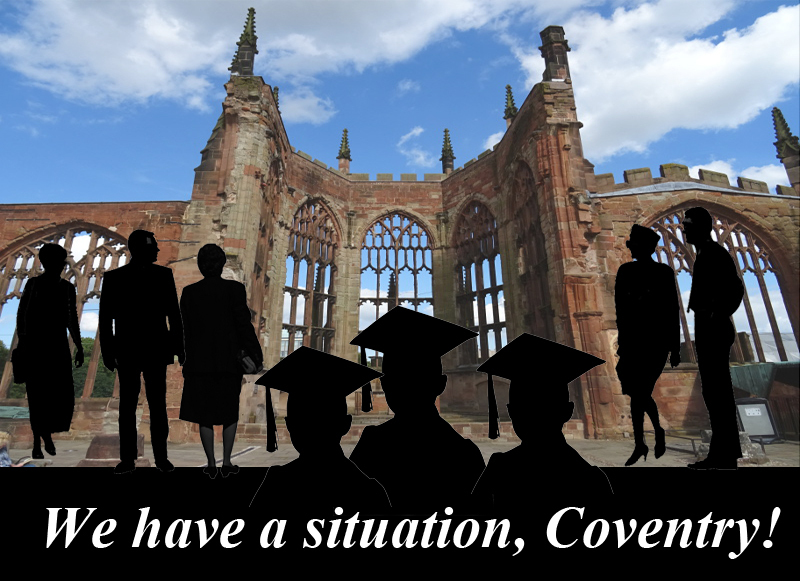 Coventry University will host the next “We have a situation!” event, on 24 November 2016, at 7pm UK time (find your local time here). “We have a situation!” is an ongoing cyberformance and discussion series that addresses current cross-cultural issues. The previous “situation” addressed water pollution in Rio de Janeiro, in the context of the coming Summer Olympics. The format of a cyberformance – created by local participants during a one-week workshop – followed by a global networked discussion, seeks to open up new perspectives on urgent local issues. At Coventry University, Helen Varley Jamieson will be the School of Art and Design’s inaugrual International Artist in Residence and will lead the creative process. Rachelle Knowles, who participated in the Graz situation, “U.F.F.”, in 2013, has initiated the project. The cyberformance-discussion event will take place on Thursday 24 November 2016 (time to be advised). Following the Coventry situation, Helen and Rachelle will attend the “InDialogue” symposium, where Rachelle is chairing a panel and together they will present “We have a situation! Coventry”.